What a blessing it is to be able to send you this update on Lea’s continually improving condition! We have just completed her most recent visit to Dr Miller, and gotten back the lab results on her blood work. She has gained a whole pound since her last visit, bringing her now back up to about her normal weight. All of her lab results are very good, although this is the first “fasting” lab test we’ve had since she became ill, and the cholesterol came back a little higher than before, but certainly within bounds. The most exciting news for us may be that she is now able to take the dressing off her “wound” during the day, to begin toughening up the skin graft on her abdomen. After months and months of being kept sterile and moistened with antibiotics at all times, the skin appears healed well enough to come out into the real world. We still put the full dressing on for overnight, to make sure we protect the skin and get some antibiotic on it to protect against infection. We have kept it bandaged and covered with plastic wrap during showers, but now she is able to shower without the bandage, and then keeps it moist during the day using lotion. The wound is getting pink, instead of that angry RED scar tissue wounds usually have, indicating that the skin is growing very well over it. We have had no skin problems since she last had drainage on March 11. Dr Miller even stated that Lea probably will not have to have the drain inserted into her abdomen since she has gone so long with no problems. The pancreas may be nearly healed. Hallelujah! I am so grateful for God’s hand in providing us Dr John Mah and the care and extraordinary attention he gave her during our days in Hartford . His decisions proved correct time after time. I hope Lea’s recovery is a source of great satisfaction for him, because he had to fight the administration and hospital politics to be able to continue treating her when things looked so dismal. He took special interest in her treatment, and we are reaping the rewards today. I thank God for putting us in the right place at the right time to have been a part of Dr Mah’s life, and beneficiaries of his medical acumen. We have now reached another milestone, in that she has recovered sufficiently that Dr Miller has approved her to travel to Texas in mid-June to attend our son Lance’s wedding. He and fiancé, Kristin, will be wed on June 17 in Austin. We plan to fly down a day early so Lea can rest up before wedding day, and then will stay over to make sure she is ready to travel back. So many of Kristin’s family members and family friends were very strong boosters while we were in Hartford , and I am really looking forward to them getting to meet Lea. She still hasn’t read any of the updates or other communications from that time, so she won’t know of their special support back then, but she is getting used to the fact that people with whom she isn’t acquainted know a lot about her. She won’t remember the folks who traveled from Texas and Maryland to visit her while she was in the coma, and I dare say they may not recognize her, since she has lost so much weight since they saw her. 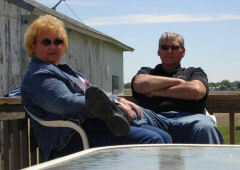 She, does, however, remember the ICU visit of Carl and Pat Monnin. Carl sang her favorite hymn to her in what she describes as a perfect tenor voice. You may recall that she even sang along on a part of the chorus. This was very powerful ministering to her, because she remembers this visit, while she can’t recall much else from the ICU. I am looking forward to them seeing each other again. I am so grateful for every single day I get to share with her I am constantly thanking God for letting her return to us. And, my thoughts travel back to the caregivers we were so fortunate to meet. There are so many who, I hope, know that they were very special to both of us, even when she was in a coma, and that you will always be remembered fondly. I keep you in my prayers, and will keep working on getting Lea healthy enough she can read about you in the updates and learn of your kindnesses and special blessings you were for us. Work progresses slowly on the book. I continue compiling the updates and emails into a journal of the epic we experienced, but it is very difficult. I try to work on it after Lea has gone to bed in the evening, but, in that quiet environment, as I proof and edit the material, reliving the horror, fear and despair just seem all too real. It’s like living it all over again, and it is tough to take in anything but small doses. Consequently it is slow going. Many nights I have just felt overwhelmed while working on the journal, and just go to bed where I can lay next to her, touching her lightly, watching her sleep, and thanking God again and again for the many blessings He has granted us. 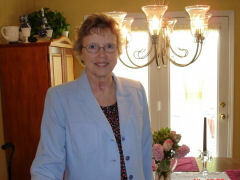 Our friends and family have done so much to help us through her recovery! We have been blessed with loving care and even some financial support to help us through this period, and we are very grateful for every single act of kindness. We live day to day, not making plans beyond a few days. We continue to go to physical therapy two or three times a week. She is getting stronger, in that she can now lift a little more weight, and has started doing some repetitions that she couldn’t even attempt earlier on in her recovery. For example, she can now do 15 lat pull-downs with 30 pound weights, while she couldn’t even get her arms over her head when we first started physical therapy! As I think of how important each of you has been in uplifting us and giving us strength and endurance, I want you to know that your prayers, your kindnesses, and your tender care have been blessings to us, and that I pray that you will be repaid many times over. I often see your faces pass through my mind as I pray for all those who have been such an integral part of our recovery. Father, Lea and I ask You to bless our friends, relatives, and others who are reading this right now. Minister to their spirit at this very moment; help them be witnesses to Your love and power as You revealed it in Lea’s recovery. Where there is pain, Father, give them your peace and mercy. Where there is self-doubt, release a renewed confidence; where there is need, please fulfill those according to Your will. Bless their homes, families, finances, and protect them in their travels. In Jesus’ precious name, we pray. Amen. Just for fun, here are some snapshots of some of our activities in May. 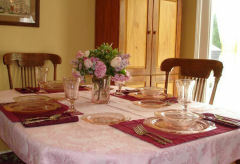 Lea has gained enough strength and stability that she was comfortable setting the table one evening with the pink glass dinnerware. 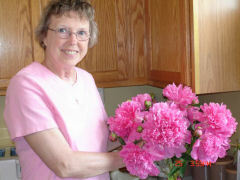 On another occasion she arranged a bouquet of peonies from our patio garden. Ready for church, she looks quite radiant! We were able to attend her brother, Jim’s, annual hog roast this past month, and we were blessed to take our friends Pat & Joe with us. Although we can’t vacation together any more, we can still, happily, pig out together. 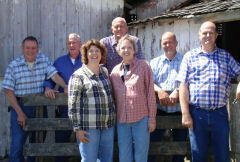 Bottom Row: While at the hog roast we were able to capture all of Lea’s brothers and sister in a group snapshot. And, Lea at the table doing her favorite things; eating what is in front of her, and eating whatever else there is!! And, finally, a shot of Canyon Lake, Texas, where we spent some time with dear friends recouping.